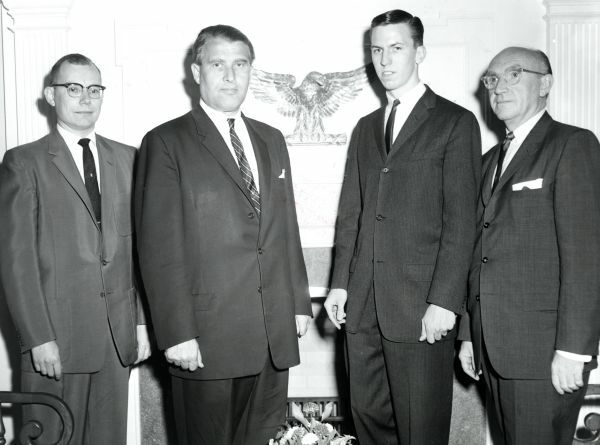 As the newly-appointed director of the Marshall Space Flight Center at the National Aeronautics and Space Administration (NASA), Dr. Wernher von Braun was invited by the Wheaton College Student Union as its last guest for the 1960-61 Lyceum season. Scheduled for 8:00 on June 3, 1961, in the newly-constructed Edman Chapel, Dr. von Braun delivered his lecture, entitled “Why We Must Conquer Space,” accompanied by illustrations, to a capacity crowd. From 1947 to 1976, he presented approximately 500 speeches, speaking on topics ranging from education and religion to the Cold War and space travel. 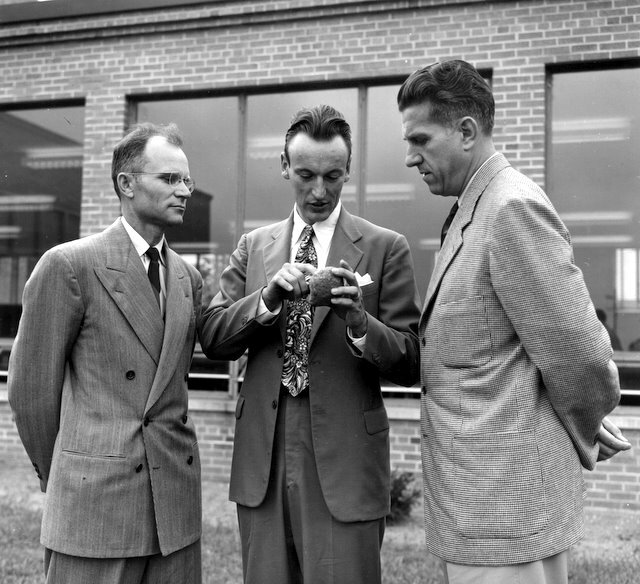 l to r: Dr. Stanley Parmerter, chairman of Division of Science, Wheaton College; Dr. Wernher von Braun; William C. Wood, chairman of Lyceum Union; Capt. Bart J. Slattery, Jr., chief of information, Marshall Space Flight Center, Huntsville, Alabama. A former member of the Nazi party and decorated war hero, Dr. von Braun oversaw during WW II the development of German V-2 rockets, employed by Hitler to blitz London. After the war, von Braun and his colleagues surrendered to the Allies and were brought to the the U.S. where they were eventually stationed at White Sands Proving Grounds in New Mexico, continuing their research on intermediate range ballistic missiles. As rocket technology matured, von Braun and his scientific team were incorporated as the nucleus of NASA, lending their expertise to its stated goal of space exploration. Operating from his lab in Huntsville, Alabama, he developed the Saturn V booster, which propelled the Apollo spacecraft to the Moon in 1969. According to W. Albert Wilson, a former NASA employee and Gideon Society member, in 1962 a troubled-looking von Braun requested to privately see him after hearing Wilson present the Gideon ministry to a church in Alabama. “When I left the office, I knew that he had become a Christian,” recalled Wilson. Later von Braun attended a Lutheran church and often read from the Gideon Bible Wilson had presented to him. We do not expect to find, through the exploration of space, tangible proof of the existence of God. But as scientists we cannot but admire His handiwork more deeply as we learn more about creation. And indirectly we learn more about the Creator…For spiritual comfort I find assurance in the concept of the Fatherhood of God. For ethical guidance I rely on the corollary concept of the brotherhood of man. Huntsville Ministerial Association, St. Thomas Episcopal Church, Nov. 13, 1962. Although I know of no reference to Christ ever commenting on scientific work, I do know He said: “Ye shall know the truth and the truth shall make you free.” Thus I am certain that, were He among us today, Christ would encourage scientific research as modern man’s most noble striving to comprehend and admire His Father’s handiwork. Religious Implications of Space Exploration: A Personal View, Belmont Abbey College, North Carolina, November 22, 1971. 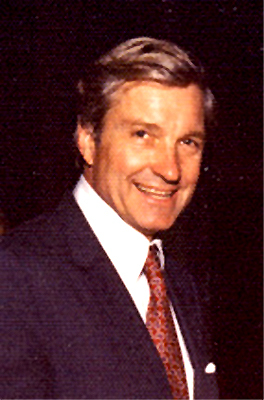 In 1976 von Braun was invited by the Lutheran Church of America to present a paper at its synod. Confined to the hospital for cancer treatment, von Braun worked on his presentation for months but was finally unable to read it when the date arrived. He died on June 16, 1977, at age 65. In this reaching of the new millennium through faith in the words of Jesus Christ, science can be a valuable tool rather than an impediment. The universe as revealed through scientific inquiry is the living witness that God had indeed been at work. Understanding the nature of the creation provides a substantive basis for the faith by which we attempt to know the nature of the Creator. Responsible Scientific Investigation and Application: A Talk Presented to the Lutheran Church of America, Philadelphia, October 29, 1976. Charles Harting Percy died over the weekend at 91. He was an unusual politician, not unlike another recently passed Republican, Mark Hatfield. Percy was on the moderate-end of the Republican spectrum, probably a bit left of Hatfield. Both were known as Rockefeller Republicans. He had broad appeal in Illinois, including in the African-American community in Chicago. 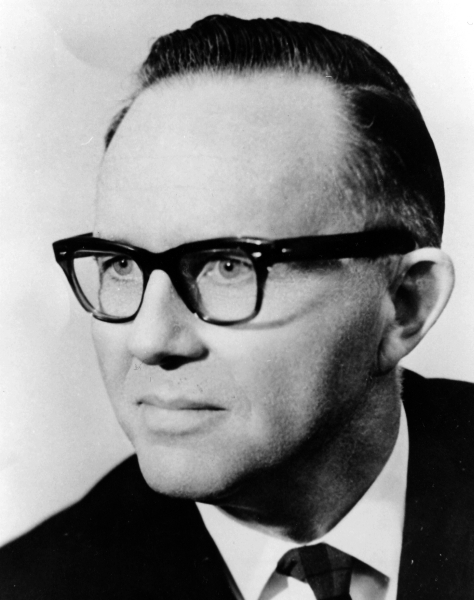 The Washington Post’s Emily Langer said, “in today’s polarized political climate, Sen. Percy would be described as a rare breed–an unabashed liberal and skeptic about military spending and war….He repeatedly clashed with President Richard M. Nixon on foreign and domestic issues.” Again, not unlike Hatfield. Born in Florida and a reared in Chicago, Percy was elected to the United States Senate from Illinois in 1966 after having worked at Bell and Howell for over 25 years. Percy remained in the Senate until 1985. On two different occasions (1968 and 1976) Percy explored the possibility of running for President, but did not run either time. His most important political act, and one that had the most enduring legacy, was overhauling the process of nominating federal judges. Implementing a system of broad input, including the bar association, Percy’s approach was unusual for the time. The Wesley Pippert papers contain several files related to the life and career of Charles Percy. Pippert served as Percy’s Press Secretary from 1967-1968 during one of the exploratory periods for the U. S. presidency. The Pippert Papers are available to researchers at the Wheaton College Archives & Special Collections. September 17, 2010 marked the inauguration day of Philip Graham Ryken, eighth president of Wheaton College. One year later it is fitting to remember a powerful prayer given seventeen years earlier to the day by Dr. Haddon Robinson on behalf of Duane Litfin, Wheaton’s seventh president. Our sovereign Father, we come to You at this solemn moment to ask You for this president, Your servant. We recognize that this is a significant moment in his life–an auspicious moment in the history of this school–and he must be terrified. He is here to lead this institution, so it will enhance Your reputation. He is here so that Your work will be advanced in the world. And he is here to see to it that the desires of Your heart will be done on this campus, as they are done in heaven where angels do Your bidding. We ask You for Your servant, to carry out this impossible task. Oh, Lord God, give Your servant vision and wisdom and courage and grace and love, so that in the days to come when we look back on the time he has spent here, Your name will have been honored, Your kingdom will have been advanced, and Your will will have been done on this campus as it is in heaven, And we ask this for Jesus’ sake, we ask it for the sake of this institution, we ask it for Your servant’s sake, and for the sake of a world for whom Christ died, Amen. We ask that You would give him vision. Help him to see clearly what others may not see. And on those days when clouds come in, may he keep in mind what this school is about and why You have brought it into existence. Help him to see clearly what You want this institution to do and be in the years that lie ahead. Eternal God, give your servant, vision. Our God, we would ask that You would give him wisdom, that the vision that he has and others share with him might be grounded in reality. Give him wisdom to listen to the divergent voices on this campus–to hear those that are saying something that is important and eternal; to ignore those that are simply speaking the fad of the hour. And give him wisdom, God, to know the difference. Eternal God, give your servant, wisdom. Our God, we would ask that You would give him courage–courage to do nothing when everybody calls him to do something, and courage to act when others are afraid to move, Give him courage to confront, And in those moments when he feels most alone, give him the courage that comes from knowing You have placed him here, and you are his guide. Lord, give your servant, courage. Lord God, we ask that You would give this president, Your servant, grace. We pray that as he endeavors to stand for truth, he shall combine in himself not only the love for truth but the love for people that characterized our Lord, Help him, Lord, as he loves truth, to hold it with grace. And as he shows grace, never to diminish truth. Give him grace as he confronts. And at times in which he must say no to everyone’s yes, may he do it with the grace of our Lord Jesus Christ. Lord, give Your servant grace. Lord God, we pray that You would give this president, Your servant, love–a passionate love for You and for Your Word; a steady love for his wife, and for his children; an embracing love for the faculty of this school; a submissive love for the trustees; and a creative love for the women and men who study here. May they know his heart, that is really Your heart in him. Give Your servant love. We would be embarrassed to ask for all of this for him, but You have called him here, You have placed him in this office, And You are responsible, Lord, to give him what he needs, to be what he needs to be beyond himself. And so we boldly ask that You would give him these things and any other things he needs to be the president of Wheaton College. Oh, Lord God, give Your servant vision and wisdom and courage and grace and love, so that in the days to come when we look back on the time he has spent here, Your name will have been honored, Your kingdom will have been advanced, and Your will will have been done on this campus as it is in heaven, And we ask this for Jesus’ sake, we ask it for the sake of this institution, we ask it for Your servant’s sake, and for the sake of a world for whom Christ died. Amen. Ebay brings forth some of the oddest things around. Sometimes it gives a glimpse into history and sometimes it just plain rips it wide open. Today’s post would fall into the latter category. Several months ago, the picture shown here (really the negative) appeared on Ebay. It purported to have been taken on the campus of Wheaton College and clearly had Wheaton connections with the individuals shown. On the far left is football coach Jack Schwartz and next to him is Harv Chrouser, athletic director. Also in the picture is a player, Jim Kielsmeier. Of course, the “800-pound gorilla” in the picture, or more accurately the 7,300 pound item, is a massive petrified oak log. What makes this picture unusual is not the subject matter so much, though this is intriguing, but that this huge log should be on Wheaton’s campus. Geologic specimens on college campuses are not unusual, but what is unusual is when they disappear, especially those of such weight and size. 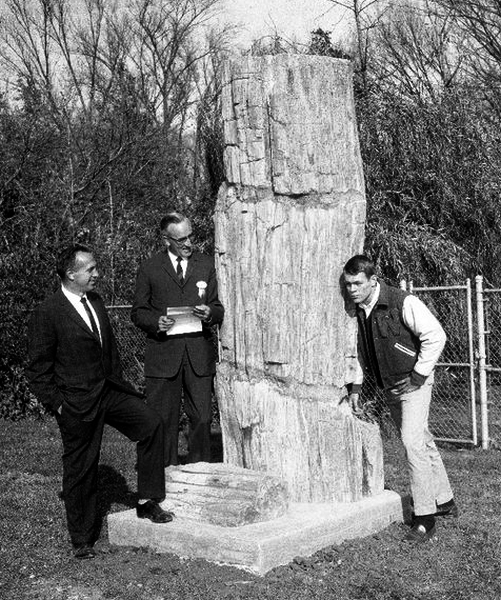 The fossilized oak log was said to have been presented to Wheaton College on October 23, 1964. However, today it can’t be found. Where does a four-ton piece of rock go to? And, not just any rock, but one shaped clearly like a log and on a large base? For those unaware, petrifaction occurs when a tree or log is buried underground and is deprived of oxygen and fails to decay. The organic material of the wood is replaced with mineral material such as quartz and the tree or log eventually becomes preserved in a solid “rock” form. The listing on Ebay sparked several emails to current Geology faculty, all of whom post-date the original gift by several decades, in order to determine the log’s whereabouts. However, the inquiries returned no answers as the log had not been seen during their tenures. Further inquiries continued to turn-up nothing. Diligence paid off as departmental archives were consulted which revealed some correspondence about the petrified log. Now that the connection was verified the whereabouts of the log were still in question. Former faculty were consulted to determine its former location. It certainly had not been stored outside the science building, though it would make a nice monument outside Wheaton’s new science center. The tale of the lost log continued until recent days when further digging uncovered a connection to Wheaton’s Facilities Management (formerly Physical Plant) staff. The “investigation” indicates that the large oak log had at some time been stored under the football stadium (built in 1956) and roughly a decade ago it needed to be relocated. Somehow a breakdown of communication occurred and the log was broken down and disposed of. Not a simple feat. Accounts indicate that a small piece was salvaged and retained as a personal keepsake. This past summer the American Scientific Affiliation (ASA) held it’s 2011 annual meeting at North Central College and co-hosted by Wheaton College on the topic of Science-Faith Synergy: Glorifying God and Serving Humanity. “Wheaton College has had a long association with the ASA, and many of its earliest activities, starting in the 1940s, involved a number of Wheaton College faculty,” according to Associate Professor of Biology Raymond Lewis, local arrangements chair for this year’s meeting. Additionally several Wheaton College students presented their research. Seventy years ago, the ASA was founded by five Christian scientists: John Haitsma, Peter Stoner, Russell Sturgis, Irving Cowperthaite, and F. Alton Everest. When Alton Everest passed away at age 95 in 2005, the American Scientific Affiliation lost the last of its five founding fathers and its first president from 1941-1950. The Records of the American Scientific Affiliation are available to researchers at the Wheaton College Archives & Special Collections. Word from the American Bible Society came over the weekend of Rev. Eugene A. Nida’s recent passing. Nida, who died at 96 years of age, had served the American Bible Society for roughly four decades. His greatest contribution to the society was his approach to training Bible translators for their work. After graduating from the University of California Nida attended Camp Wycliffe and worked among the Tarahumara Indians in Mexico. He was a charter member of Wycliffe Bible Translators. Nida, born November 11, 1914 in Oklahoma City, was an anthropologist who had studied patristics and drew upon the fields of linguistics, anthropology and communication science to develop a new approach to translation work that became known as “dynamic equivalence” (later “functional equivalence”). This methodology later influenced secular translators in their work. This new methodology sought to retain local idioms through faithful adaptation of the text. His work helped jump-start the translation process that had previously relied heavily upon Western missionaries that were unfamiliar with the local language and its nuances. The newly developed dynamic equivalent translations were more readable and easily-understood than the stiff and wooden word-for-word translations that had been the previous standard. Nida’s work fostered the creation of Bible translations in Navajo, Tagalog, Quechua, Hmong and hundreds of others. In the United States Nida’s work influenced the creation of the Good News Bible, a colloquial English-language version originally intended for non-native English speakers that was first published beginning in 1966. Nida’s legacy continues on at the American Bible Society through the Eugene A. Nida Institute for Biblical Scholarship. Ruth James Cording (who graduated with a literature degree from Wheaton College in 1933) was born and raised in Auburn, New York, of Welsh and Irish descent. Her father was a Baptist pastor and her grandfather, Evan Thomas James, had emigrated in 1866 from Wales. In fact, Auburn greatly resembled Wales, from its rocky terrain and rolling hills. Ruth knew she had cousins yet living in that distant land of poets and singers and was fully aware of the Welsh contribution to Christian hymnody and revivalism, but her interest burst aflame when she discovered in 1958 her grandfather’s diary, written in 1887 when he returned to Wales to visit his aged mother. Her curiosity piqued, she decided to investigate that “…damp, demanding and obsessively interesting country,” as historian Jan Morris writes. First, however, Ruth read as many books as she could locate. Her research provided the core of her Welsh book collection. Soon thereafter in 1962 she met a cousin, Neli Davies, visiting the U.S. One year later, Ruth and her husband, Ed, full of purpose, journeyed at last to the brooding, storm-swept land of Wales and happily engaged “…the friendliest people on earth,” as she and Ed determined. They spoke in Capel Ficar, the chapel where her grandfather had attended as a child, and located the graves of her great grandparents, buried in the church cemetery. They also visited cousin Neli at her cottage, stacked from floor to ceiling with Welsh books – many of which she eventually presented to Ruth. When Ed retired from the Directorship of Wheaton Conservatory in 1970, he and Ruth rented a flat at New Quay on the shores of the Cardigan Bay on the Irish Sea. Settled for a comfortable stay, they traveled to the Preseli Islands, marveling at the “blue stone” transported to Stone Henge. They visited St. David’s Cathedral and saw the “Bleeding Yew Tree” at Nevern and the schoolchildren’s graves at Aberfan, site of the tragic mine disaster. 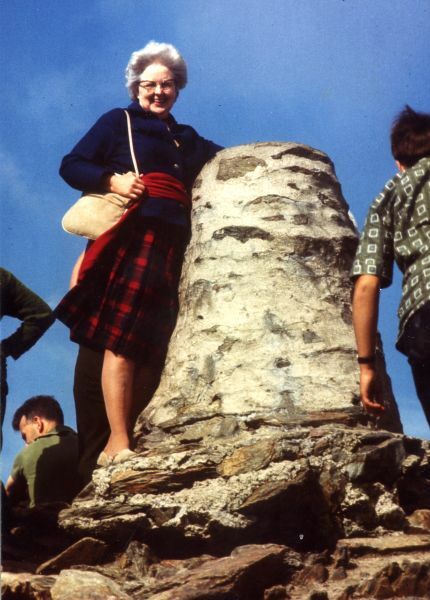 Continuing apace, they saw David Lloyd George’s monument in Cricceth and ascended the summit of Snowdon with its glorious view of the countryside, placing a stone on top, according to Welsh custom, “…though getting down was a bit rough,” Ruth remarked. They attended the International Music and Poetry Festival at Llangollen and searched out the home of William Williams, the songwriter who wrote “Guide Me, O Thou Great Jevovah.” Among other high points they watched the weaving of a Welsh wool tapestry at Altcaven Mill and saw potters spinning clay at their wheels. They followed the Arthurian Grail legend from English Glastonbury to Ozzleworth, from whence seven monks, carrying the sacred olivewood “cup of healing” had fled during the dissolution of the abbeys, traversing the mountains to Strata Florida Abbey and then to the mansion at Nanteos. They even caught a glimpse of the legendary cup when it was displayed at the National Library of Wales. By motorcar they journeyed the National Library at Aberystwyth and also to the National Centre for Children’s Literature nearby. She and Ed were guided to the village of Laugharne where Dylan Thomas is buried, and climbed up to “the Boathouse” where many of his poems were written. During this visit Ruth called the Welsh writer, Dr. D.J. Williams, lovingly called “The Granddaddy of the Welsh.” He encouraged her to write about Wales for American children. She was also introduced to Waldo Williams, the renowned Welsh poet, and visited the double-naved chapel of R.S. Thomas, the famed British poet who lived in sight of picturesque Bardsey Island. All the while they took slides, capturing innumerable picturesque moments. In addition to traveling, Ruth published several short stories, articles and books, including The Turquoise Bracelet (1959), Glenn and Bill at Prospect Point (1953) and C.S. Lewis: A Celebration of His Early Life (2000). She was instrumental in assisting Dr. Clyde Kilby with establishing the Marion E. Wade Center. On St. David’s Day, 1991, Ruth Cording donated her Welsh books to Wheaton College, stating, “It is our hope that this collection, which will be added to year after year, may be a source of great satisfaction and usefulness here at Wheaton College even as it has been to me.” Ruth died on May 5, 2008, just shy of her 97th birthday. The Ruth J. Cording Welsh Language and Literature Collection (SC-43) is available to researchers on the third floor of the Billy Graham Center.